Breathe. You can do it. Believe it or not, there is a way to get all your important stuff on that plane with you. You just have to pack smart. What should I take in my carry-on bag? If you're enroute to your holiday destination, you should include the necessities you would need to survive for a few days should your main bag be delayed or lost. In this case, a spare shirt or underwear and harder-to-replace or more expensive items (phone chargers, contact solution, some basic makeup, etc) are a good bet. If you're going somewhere with vastly different weather to the place you're leaving, throw in a coat (roll, don't fold) or Tshirt so you don't freeze / boil the second you step off the plane. If you're flying for work, make sure you don't have to show up on the first day of meetings in a hoodie (you don't have to pack a whole outfit - maybe a nice blazer or that coat would smarten up your traveling clothes in an emergency?). If you're flying home from a trip abroad, your carry-on can be lighter - presumably you have clothes at home you can wear if your main bag gets lost, yes? If you're lucky enough to be able to country-hop with a single flight, this won't apply. But if you're from some far-flung corner of our planet or flying an airline that requires a plane switch, this can inform what you should pack. If you have 13 hours to kill in an airport, you will need to pack entertainment (unless you're the sleeping kind... Neck pillow for you then). For longer layovers, think about packing reading material, gadget chargers (don't forget about adapters) and some snacks that won't get security in a huff (cereal bars have worked for me). If you're going to be schlepping your carry-on bag around a massive airport, you will want to keep it as light as possible too. Most airlines have a weight limit of 7kg, and maximum bag dimensions to ensure your case actually fits in the overhead storage racks. If you're flying internationally, the standard rules for liquids apply (not more than 100 millilitres in each container, all grouped in a clear sealed plastic bag). In some regions, there may be rules against carrying certain types of batteries in your carry-on luggage, while others may require all electronics to be turned on when going through security (so pack your charger rather than lose your phone). Double check the rules before you fly so you can plan around them. Are you the type that starts playing the in-flight movies before the plane has even left the runway? Do you try your best to sleep through the whole thing? 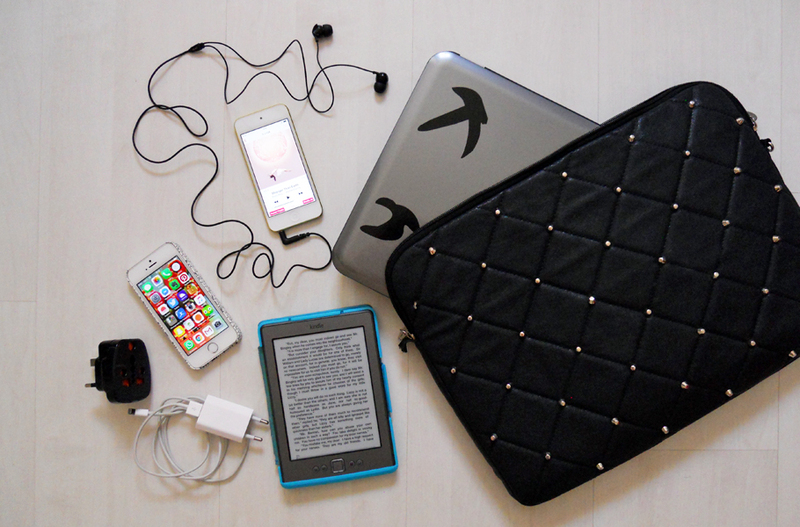 Chances are you won't need much to keep you happy and can save space in your bag. Otherwise, you will need to pack distractions like reading material or music. After international flights with various airlines on five continents, I have refined and distilled my carry-on repeatedly to a core set of items. Yes, I may add a coat or more snacks depending on the trip, but these are my staples. I've found canvas bags work best, mainly because the bag itself is super light so your weight limit can actually be used by the stuff inside, instead of spent on the bag. It's easy to carry about and use as a pillow during layovers. It also doesn't set off as many "let me weigh and measure that" flags when you check in as a mini suitcase would. I travel a bit for work, so my laptop is almost always in my carry-on (take it out of that messenger-style laptop bag. Now. Get a lighter cover). I don't like taking a risk on in-flight entertainment (Sigh, still the same New Girl box set as last time?) so I bring my iPod and headphones (this doubles up as sensitory deprivation apparatus in case of engine noise or screaming children on the flight), as well as my phone (in flight mode but mostly off to save the battery) and Kindle. I only carry a charger for the iThings and laptop (battery life on the Kindle is great and it uses a more easy-to-replace standard charger) and I always take adapters since South Africa uses a strange plug type and they're difficult to get once you've left the country. I wear contact lenses but find it's more comfortable to fly with my glasses, so my little plastic bag is all about the travel sized solution and contacts case. Otherwise, it's just the basics to look presentable in case my bag is lost and survive the dry cabin (perfume, foundation and lip balm) as many airlines supply mini toothbrush kits for free. Airlines mainly serve food just after take off and about an hour before landing on longer flights, which can lead to meals at odd times (3am? Time for breakfast!) so I usually stash some snacks too. Okay, I'm being (a bit) dramatic. I can obviously survive a flight without this stuff, but I would emerge as the human equivalent of grumpy cat. I try my best to sleep on flights, so my eye mask, neck pillow and iPod combination blocks out sights and sounds in a cloud of squishy happiness (those supplied pillows are awful. Neck pillows are a good investment if you fly a lot). I also get cold easily (why are aeroplanes always freezing?) so I always take a jersey too. Obviously. 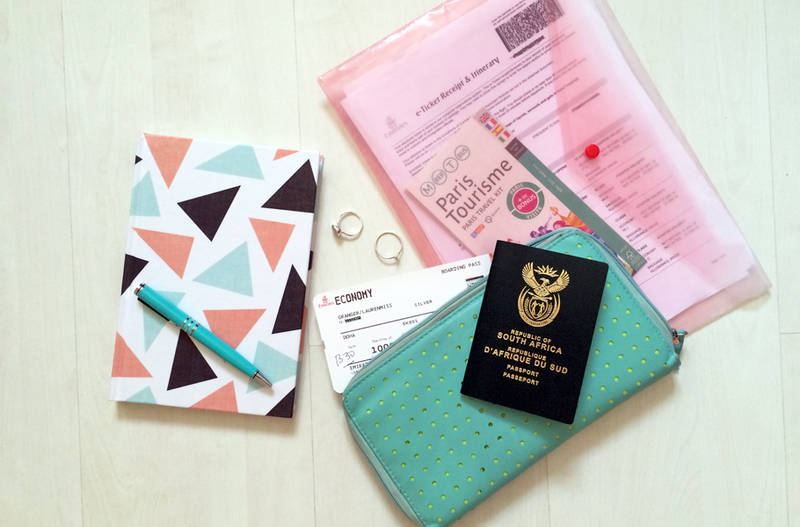 I've found travel wallets work best for keeping track of things (how often have you had to hunt for a boarding pass? Those things are sneaky!) and can double up as a purse (leave all your loyalty cards, local currency, etc. at home). I also print out all the flight and hotel confirmations and carry them in a folder (storing a scanned copy of your passport in a place you can access online isn't a bad idea either). I also keep valuable items on me instead of in my main luggage. I usually carry a notebook too, as I always feel inspired in airports for some reason. Notebooks are also a good way to keep track of trains you need to take, etc, in case you're in a new, unsafe area alone and don't want to advertise the fact that you're a lost tourist and have a smartphone. Have you mastered the art of the carry-on? 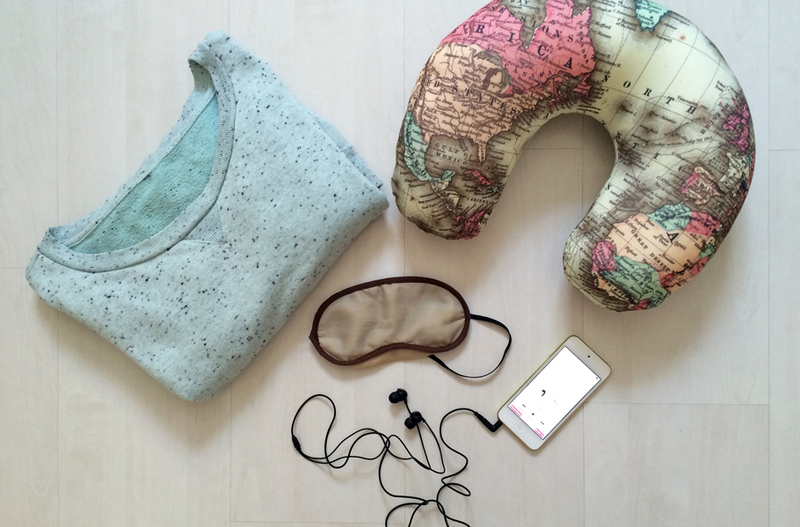 What are your essentials? Let me know in the comments! 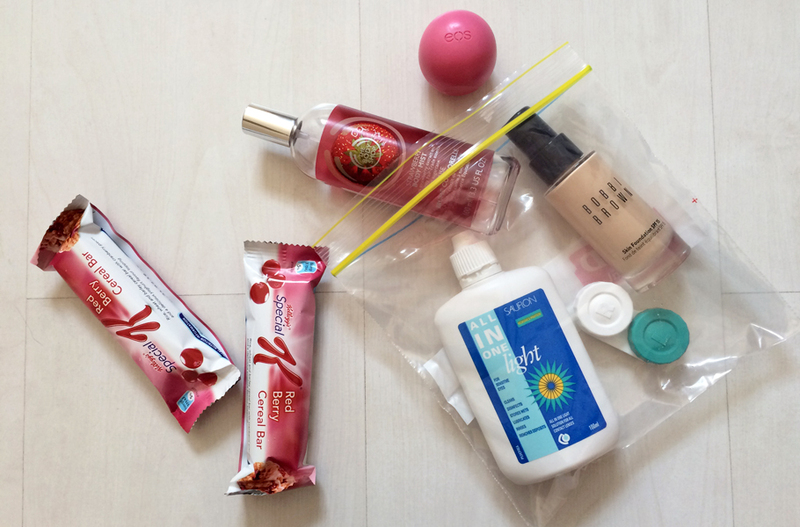 Curious about my travel kit and favourite must-haves? Read my post on my essential travel gear. Featured travel kit: Neck pillow, mint travel wallet, triangle notebook and blue pen, neon pink luggage tag, studded laptop case: all Typo. 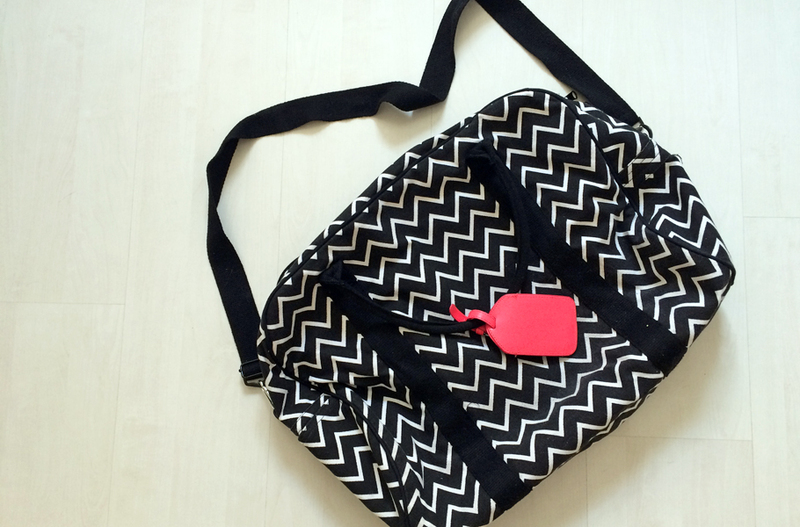 Canvas bag: Cotton On (similar: Country Road). Noise-cancelling headphones: Sennheiser.